Sometimes a design starts with a DOODLE. This entry was posted in Uncategorized on June 6, 2017 by julesmeans. Lap work is my favorite needlework. I love to knit. Embroider. Hand stitch. Mend. Lately I have been taking things apart so I can harvest pieces of fabric to use elsewhere. 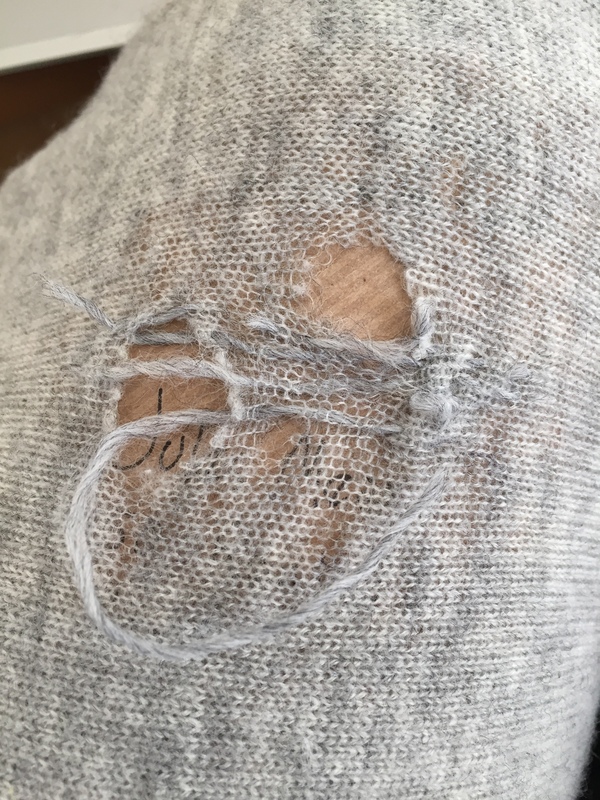 I love to painstakingly pick out stitches and cleanup the bits of thread up with my lint roller. In knitting and sewing either by hand or on the machine I never seem to mind if I discover a mistake and have to go back. 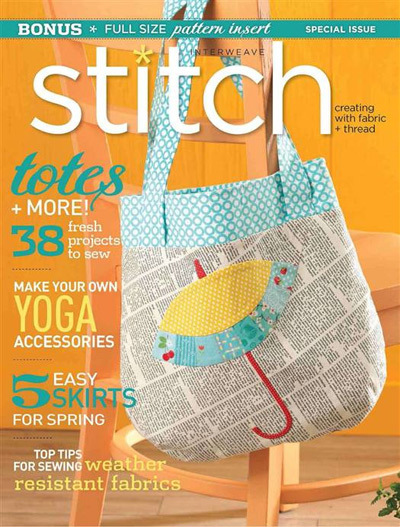 Picking, snipping and “unsewing” is as relaxing and satisfying as completing a finished project. I like to do a thing over and over until I get it right. 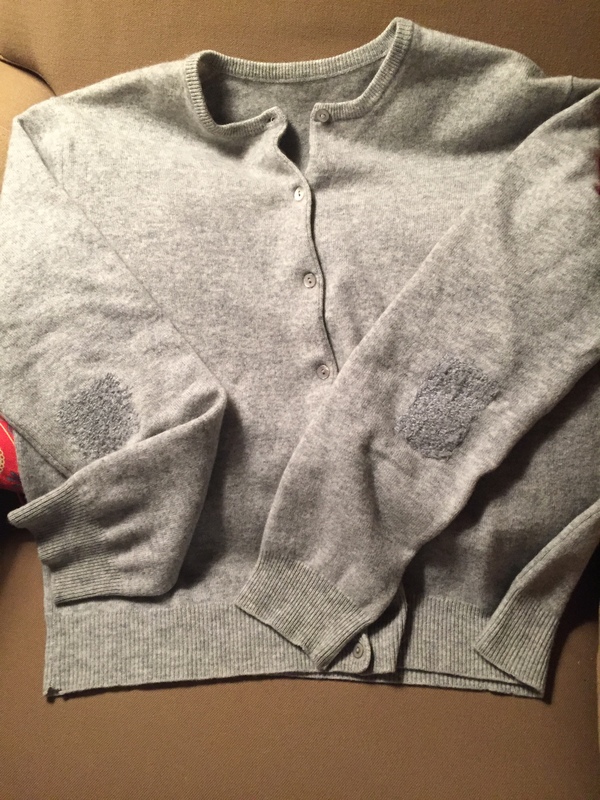 I like to buy cashmere sweaters on eBay and love to wash them in the sink gently squeezing them in warm water with shampoo. Then I rinse and squeeze again in fresh warm water and put them in the washing machine to spin out the water (never let them agitate or they will shrink and full (felt). Then I pop them into the dryer for only about 10 minutes with a fluffy dry towel, take them out and hang them on padded hangers to dry completely. The fibers bloom and they smell lovely- use shampoo that smells good to you. I do not ever have them dry cleaned. I don’t trust the toxic chemicals and they just don’t seem clean. They will not shrink if you are gentle with them. And here is the process. 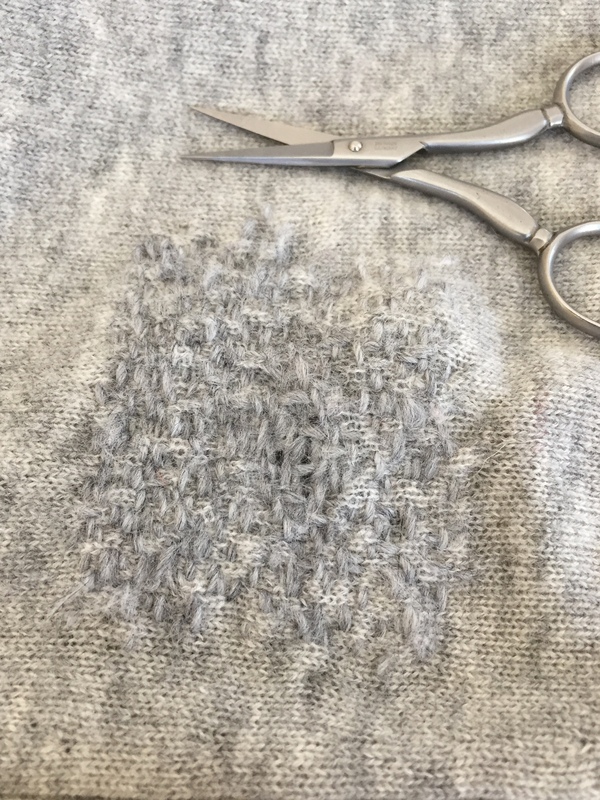 I had to practice and I took all the threads out a few times to start over. The most difficult thing is to let the fabric lie flat and to not pull or stretch the long warp and weft stitches as you create them. Puckering will result in an unsightly patch. I was snowbound up in Maine for a week house and dog sitting for my kids while they escaped to sunny Sanibel Island. This was the perfect time to perfect this discipline. I had never mended anything this way. For thread I used some gray knitting wool by Cascade. It was 3 or 4 ply (I now forget) and very soft. I had to pull and let it twirl as I separated it. I used long lengths and pulled carefully creating a very rough looking web. I just kept going, weaving in an out making it bigger around the edges. I don’t know if I did this a traditional way, but I do like the end result and am ready for the next worn out sweater. This entry was posted in Cashmere, embroidery, mending, sewing, Slow Stitching, Textiles, Wool Applique on February 25, 2017 by julesmeans. 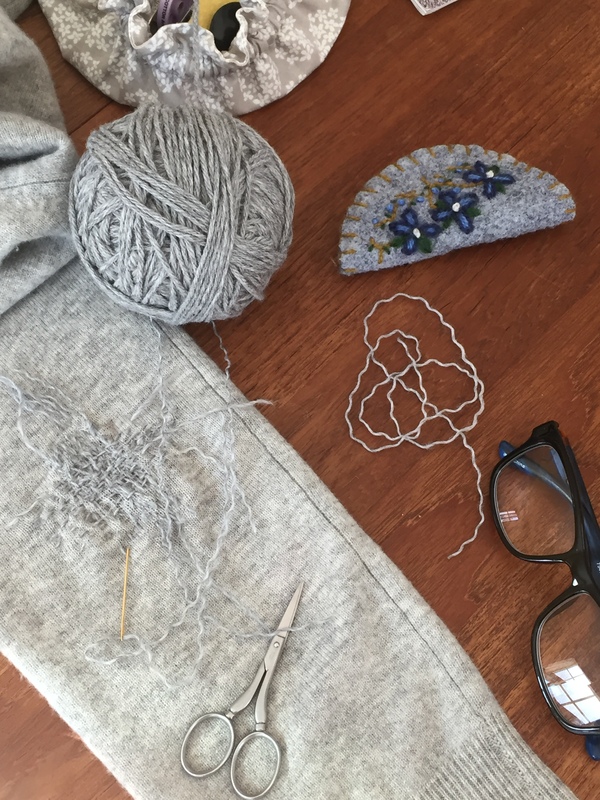 I’ve been reading about Natalie Chanin and her beautiful line of clothing made with her hand appliquéd cotton knit fabric. I’ve started with two layers of fabric cut from two t-shirts, one white and one gray. 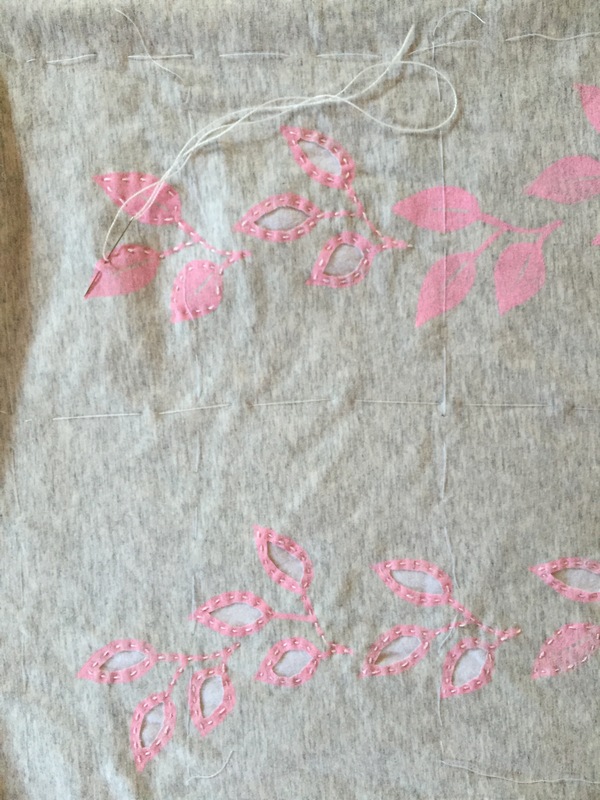 I mixed up some pink paint and block printed the leaves onto the top gray fabric and then basted the layers together. Using #8 perle cotton I basted around the prints just inside the edges through both layers. Then I went back and cut out the centers of the stitched leaves. I think that her method for constructing clothing is to cut out the pattern pieces, work the stitching on them and then sew the garment together. This is my first attempt and I have no plans for it, but I think I will be making something to wear eventually. I love to have lap work I can bring around with me and this is perfect. This entry was posted in Block Printing, Inspiration, sewing, Textiles on August 13, 2016 by julesmeans. I made these silver bangles recently. My wrist measures about 5 1/2″ around. 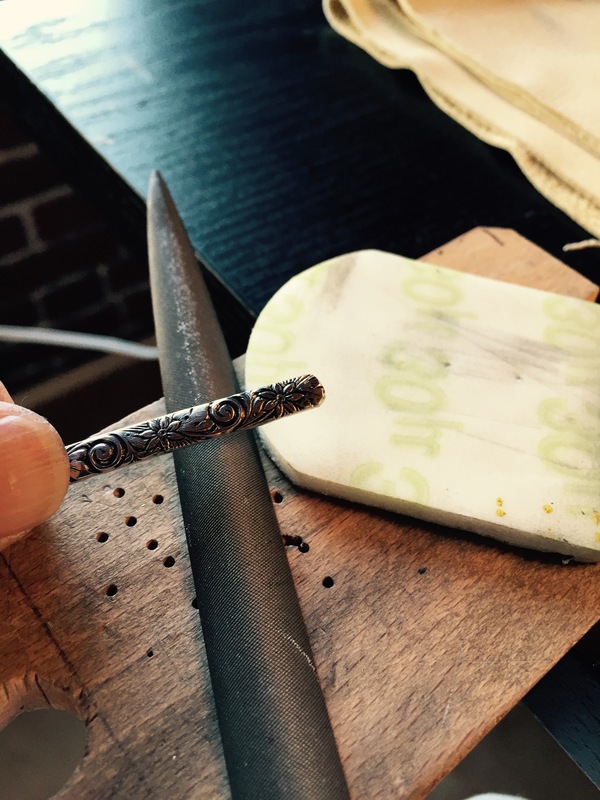 The plain one is 6 1/4″ and the patterned one is 7″ long. I filed the ends and rounded them a bit first. Then I rubbed a black Sharpie pen into the patterned one. In a class you would be advised to darken your silver with Liver of Sulphur to form the patina. This effect can also be achieved by putting the silver in a closed container with the yolk of a hard boiled egg. Both ways smell bad. 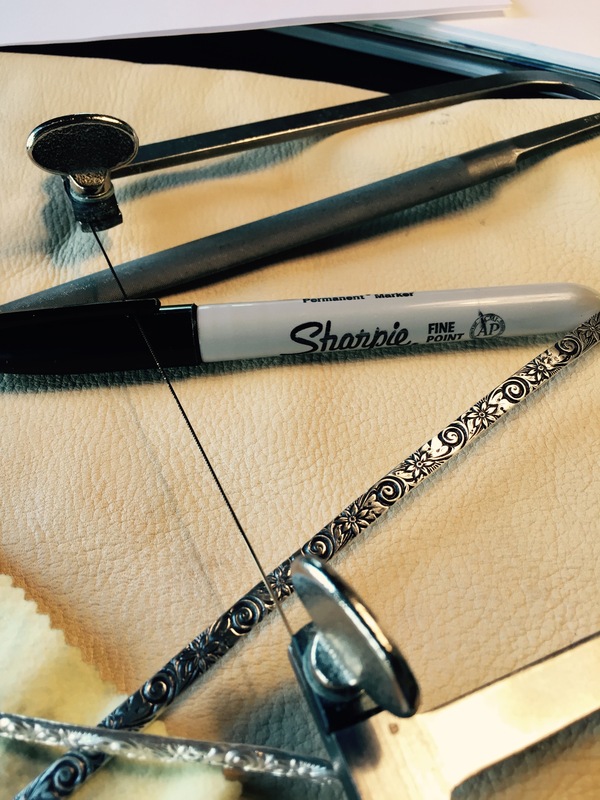 I use the Sharpie and then rub the piece clean with very light jeweler’s sandpaper. When it’s cleaned off and the markings are black I polish it with a buffing cloth to get any scratches off. To shape them I used two dowels, gently curving them around a bit at a time keeping both ends even. 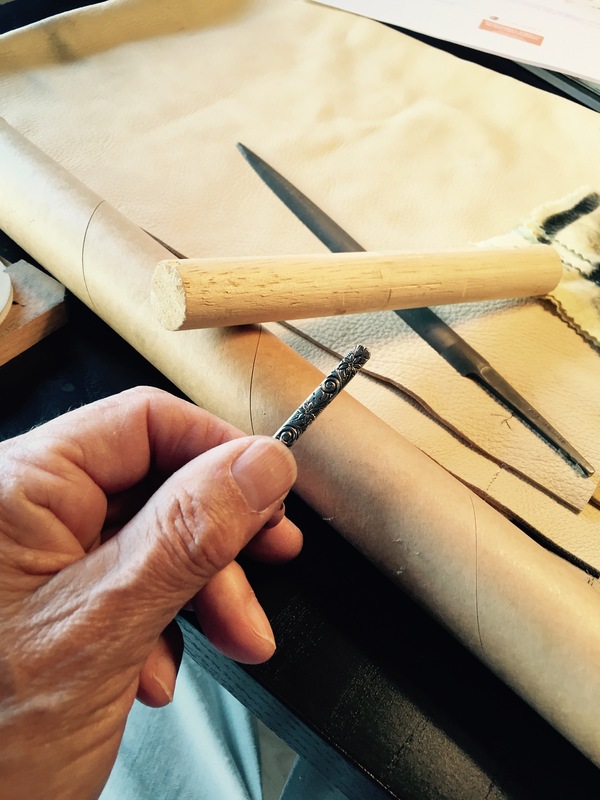 The first dowel was 1 1/4″ in diameter and the smaller one 3/4″. Then I fiddled with the ends a bit using my plastic coated pliers. I made them so I could slip them on my wrist sideways and then I squeezed them till I liked the way they fit. 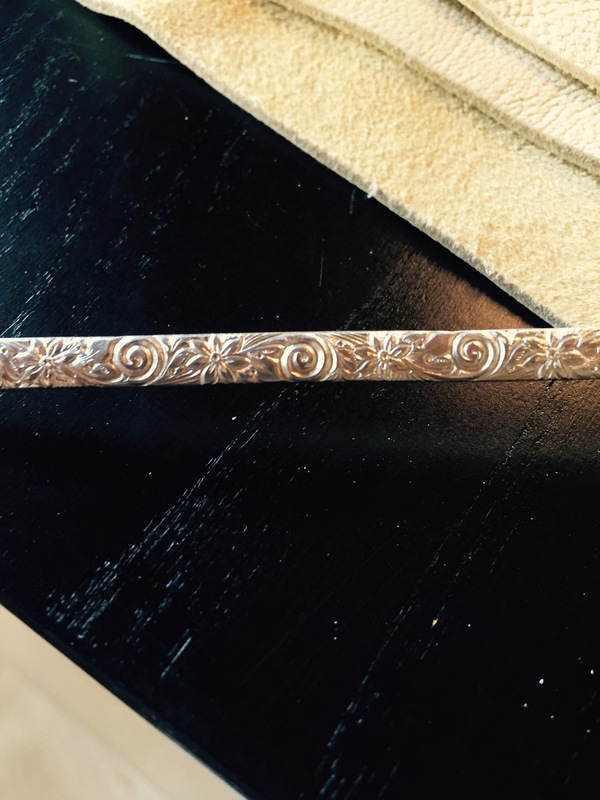 It’s best to bend and curve the silver very carefully. If the bracelet becomes distorted it is very hard to correct the mistake. 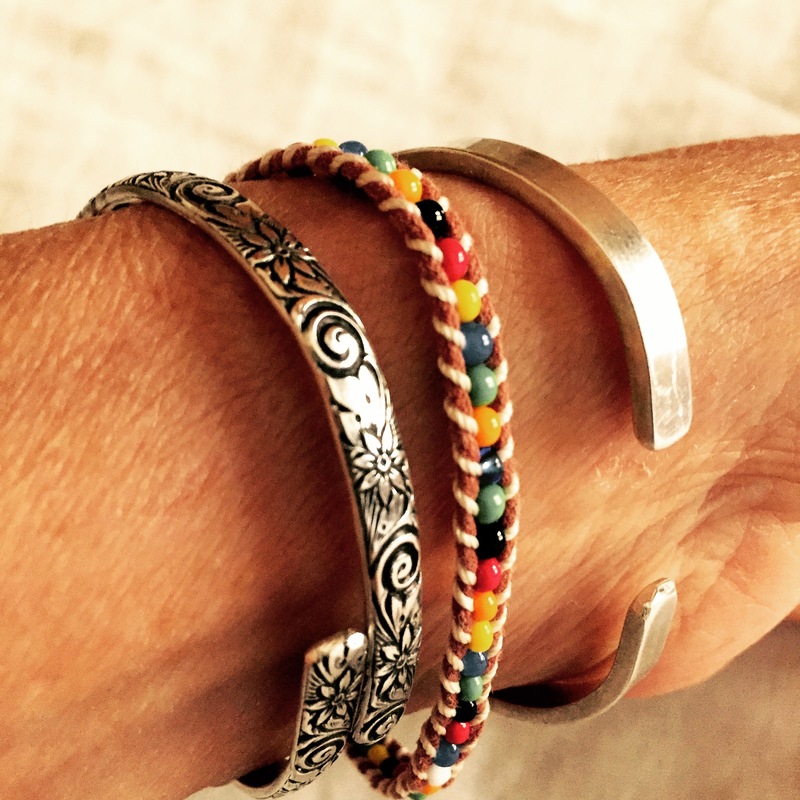 The plain bracelet is “Wire SS Flattened Plain” item #101515 and the other is “Pattern Wire SS” item #102119. SS means sterling silver. This entry was posted in Handmade jewelry, Jewelry and tagged bracelets, jewelry, silver, sterling on October 12, 2015 by julesmeans. The soft cashmere scarves I’ve been making are incredibly soft and warm as toast. The gray and blue one is an Infinity style. That means that it’s stitched together at the ends. To wear it just loop it over and around your neck till it feels just right. The camel colored ones are from a fabulous thrift shop find- a long cashmere skirt with tags still on! A score at $30 at Plum here in Beverly, MA. I decided to add trim to the ends of these and then whip stitch them closed. The trim adds a bit of body and so they lie flat against my chest. A good look I think. Hunting for cashmere on eBay and in thrift shops has become a favorite sport for me this winter. What should I do with the scraps leftover? This entry was posted in Uncategorized on July 20, 2015 by julesmeans.